F Waltteri Hopponen (Everett, 2013-14) has signed a one-year contract with Espoo United (Finland, Mestis). This season, with HPK Hämeenlinna (Finland SM-Liiga), he had one assist in 21 games. On loan to LeKi Lempäälä (Finland, Mestis), he had six goals and eight assists in 23 games. There was never any chance that F Keegan Kolesar of the Seattle Thunderbirds would be suspended after he took a minor penalty for kneeing in OT during Game 2 of the WHL’s championship final for the Ed Chynoweth Cup on Saturday in Regina. During a scrum, Kolesar issued a post-whistle knee to Pats D Connor Hobbs. The Pats scored on the ensuing PP, to record a 4-3 victory and tie the series, 1-1. Hobbs went down after the knee struck him, but wasn’t injured. “A team cannot request supplemental discipline for a minor penalty unless there’s an injury that will keep the player out of at least one game,” Richard Doerksen, the WHL’s vice-president, hockey, told Greg Harder of the Regina Leader-Post. Doerksen looks after discipline for the WHL. Had Kolesar been slapped with a major and game misconduct, Doerksen would have given the play an automatic review. Interestingly, Kolesar missed Game 1 of the championship series as he served a one-game suspension handed down after he took a checking-from-behind major and game misconduct in the last game of the Western Conference final with the Kelowna Rockets. Harder’s story is right here. GM Joe Sakic on Denver radio : “There’s going to be a lot of turnover,” said Sakic. “We’re going to get some younger guys in here." The Regina Pats are to be the host team for the 2018 Memorial Cup. As such, they have at least some hope of luring F Tyson Jost into their lineup for the 2017-18 WHL season. Jost played this season at the U of North Dakota, then finished up with the NHL’s Colorado Avalanche, which had taken him 10th overall in the 2016 NHL draft. Jost, who turned 19 on March 14, had 35 points, including 16 goals, in 33 games at UND, then added one goal in six NHL games. He also played for Canada at the World Junior Championship, putting up a goal and three assists in seven games. 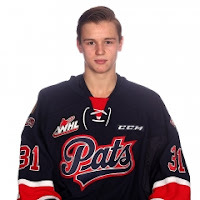 The Pats acquired Jost’s rights from the Everett Silvertips, who had selected him with the seventh overall pick in the 2013 WHL bantam draft. However, judging from the above quote from Joe Sakic, the Avalanche’s GM, it could be that Jost is ticketed for the NHL team next season. 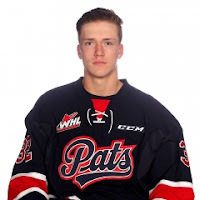 The Prince George Cougars have signed D Jack Sander, 17, of Beaumont, Alta., to a WHL contract. Sander played the past two seasons with the midget AAA Leduc, Alta., Oil Kings. This season, he had three goals and eight assists in 34 regular-season games, then added two goals and five assists in 14 playoff games. The Cougars got a good look at him during the recent Telus Cup national championship in Prince George, where he had a goal and an assist in five games. The Everett Silvertips announced Tuesday that they have signed Bil La Forge, their director of player personnel, to a “multi-year contract extension.” Jesse Gelenyse of the Everett Herald reports that it is a two-year extension. . . . La Forge, who turned 43 on Tuesday, has completed three seasons as Everett’s director of player personnel. From Edmonton, he signed on with the organization as a scout in 2008 and was promoted to head scout for the 2011-12 season. In the WHL, he also has worked with the Tri-City Americans and Lethbridge Hurricanes. . . . La Forge’s late father, Bill, did a turn as head coach of the NHL’s Vancouver Canucks and also coached the WHL’s Regina Pats and Kamloops Junior Oilers. F Colby McAuley, who played out his junior eligibility with the Prince George Cougars this season, has signed a two-year contract with the AHL’s San Jose Barracuda. . . . The Barracuda is the AHL affiliate of the NHL’s San Jose Sharks. . . . In 191 regular-season games with the Cougars, McAuley had 44 goals and 52 assists. This season, he had 26 goals and 29 assists, both single-season highs, in 68 games. . . . After the season, he signed an ATO with the Barracuda and recorded two assists in four games. Mike Fraser, the Writing Scout, completed his 12th season as a WHL scout with the end of Thursday’s bantam draft. In this week’s column for the Brandon-based Westman Journal, Fraser lets us in on a scout’s feelings as another long season draws to its conclusion. That column is right here. In the QMJHL, the visiting Saint John Sea Dogs beat the Blainville-Boisbriand Armada, 2-0, on Tuesday night and now lead the championship series, 3-0. They’ll play Game 4 in Blainville-Boisbriand tonight. . . . G Callum Booth earned the shutout with 22 saves. F Samuel Dove-McFalls (5) scored both goals, the first at 12:28 of the second period and the second at 19:44 of the third. . . . Announced attendance was 3,500. . . . The OHL final also resumes tonight. The visiting Erie Otters hold a 2-1 lead over the Mississauga Steelheads. Sam Waterfield is the new head coach of the junior B Saanich Braves of the Vancouver Island Junior Hockey League. Cook replaces Brad Cook, who remains with the organization as vice-president of hockey operations. Waterfield is a former Braves defenceman who has been attending NAIT in Edmonton. . . . Mackenzie Valentine, who also played for the Braves, will be staying on as an assistant coach. . . . This season, the Braves finished second in the five-team South Division, at 29-15-1-3. In the playoffs, they dropped a first-round series to the third-place Kerry Park Islanders in six games. Former WHL/NHL F Mike Sillinger has joined the staff of the Okanagan Hockey Academy as a skills coach. Sillinger, 45, worked with the Edmonton Oilers as their director of player development (2008-15), and also has been an assistant coach with the midget AAA Regina Pat Canadians (2013-17). Amy, Lukas, and I: thrilled to add a 4th pair of shoes. Proud to announce Baby Benton #2 is on the way. Thunderbirds are being asked "what went wrong? "-style questions right now. It's pretty simple. They faced a goalie who stole a game. playoffs on a wrist shot through traffic. At that point, eight of the 13 goals scored in the series had come from defencemen. . . . Seattle tied it at 14:48 as F Sami Moilanen (5) scored the only even-strength goal of the period, this one coming off a rebound. . . . Regina was 2-4 on the PP; Seattle was 1-4. . . . Seattle’s chances on its final PP weren’t helped when Barzal was hit with an embellishment minor, with Regina F Wyatt Sloboshan taking a hooking minor on the same play. . . . Seattle head coach Steve Konowalchuk didn’t like that call one bit, telling reporters: “If a guy throws his hands up and loses his stick, it’s a sure sign of penalty.” . . . True’s 10th goal of these playoffs set a single-playoff franchise record, breaking the mark set by F Torrey DiRoberto in 1997. (Stick tap to TBird Tidbits). . . . Regina scratches: F Adam Brooks, D Dawson Davidson and F Jake Leschyshyn, all with injuries, G Max Paddock, F Duncan Pierce and F Owen Williams. . . . Seattle’s scratches: G Rylan Toth (injured), F Elijah Brown, F Tyler Carpendale, F Dillon Hamaliuk, D Jake Lee and F Luke Ormsby. . . . Announced attendance: 6,178. . . . Greg Harder of the Regina Leader-Post has a game story right here. . . . Andy Eide of 710 ESPN Seattle has a game story right here. Regina vs. Seattle, at Kent, Wash., 7:35 p.m.